How To Save Money Dining Out - Women and Money Inc.
Who doesn’t like dining out? We all like to get a little break from the kitchen and dishes now and then, have someone else do the cooking, and savor the delicious food. 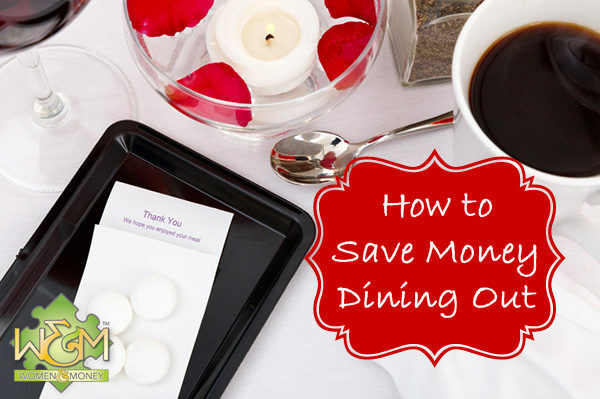 But dining out can be very pricey, so for those of you trying to reign in the dining out budget, we present 10 ways to save money dining out. 1. Fake it with restaurant copycat recipes. Admittedly, this is a bit of a cop out, because sometimes you just don’t feel like cooking. But for those times when you’re craving a certain something, and have a little spare time, try out a copycat recipe. It might turn out even better than the original, and it’s bound to be cheaper! 2. Gift cards and gift certificates, oh my! Make sure you use any gift cards or gift certificates you have before spending any of your own money. Keep them all in a safe place so you know where they are and what you have, then check them before deciding where to dine out. Another savvy move is to purchase gift cards at discounted rates. Restaurant.com offers these to American restaurants, and some retail stores will sell restaurant gift cards below the card value, so keep your eye out for deals! 3. Coupons and vouchers, don’t be shy! Fast food coupons are delivered in the mailbox or newspaper, why not use them? You can find coupons to slow food restaurants as well, sometimes printed in the paper, or available online. Just keep a look out for them. And if you subscribe to group discount voucher providers (such as Groupon) you can find plenty of deals for local restaurants, usually around 50% off. Make sure you read the restrictions first, and use before the promotional value expires. Are you worried the waitress will judge you when you present a coupon? Who cares? She probably uses coupons anyways, it’s the smart way to dine out! Just be sure to tip based on the pre-coupon total as per dining etiquette. Drinks have very high mark-ups at restaurants, usually a glass of pop/soda/cola costs more than a 2 litre bottle at the store! The same goes for juice and alcoholic beverages — a glass of wine can be the price of a whole bottle. You don’t go to a restaurant for the drinks, so save your money and drink free water. Ask for a slice of lemon in it if you don’t like plain water. 5. And on that note, skip dessert. Who needs the extra calories anyway? Dessert can really blow the budget while dining out. If you are really craving that delicious looking cheesecake/brownie/pie on the menu, pick one up of from a nearby grocery store or bakery for a fraction of the price (if it’s for two or more people to share that is). 6. Get a doggy bag. What’s that, a doggy bag doesn’t sound very appetizing? To your budget it is. Sure you can pretend it’s for your dog, but your leftovers can replace a snack or even one of your meals the next day, which saves you money in groceries or eating out again. So choose restaurants with large portions and good prices to make your money go further (ps this doesn’t work for salad). The best kind of leftovers are pasta and pizza, particularly if you reheat them in a fry pan rather than the microwave. 7. Pick up instead of delivery. Most delivery restaurants either add a delivery fee to the order, or alternately provide a discount to pick-up orders. Restaurants within delivery range of your house will cost less in gas for you to drive to than their delivery fee, so why not pay yourself for delivery instead of them? Always ask about the delivery fee or pick-up discount when placing an order if it’s not listed on their website or take-out menu. Added bonus of picking up take-out: you don’t have to tip the delivery man/woman. Get familiar with the weekly specials of your favorite eateries so you know which night you can get the half price appies, $5 steak or all-you-can-eat pasta. For families, kids eat free restaurants present a great savings, so why not take advantage? Order what you consider to be good value for the money – something you can’t easily make at home, something that will make good leftovers, and something that doesn’t have a huge markup on the ingredients involved (you can make it yourself much cheaper).